I have always been fascinated with ancient history. I used to dream of living in the great ancient civilisations of Egypt and Greece. I would romanticised it all in my head. Machu Picchu, Petra, Jordan all featured in my Bucket List. I find it all so fascinating. Their rise and fall. Their wars, their architecture, their creations. As I grew older, I realised that I wasn’t too far from home in terms of ancient civilisations. Civilisations such as Majapahit and Singhasari gripped and enthralled me through high school and made studying history at school enjoyable. So, when I discovered and learnt about the civilisation in a neighbouring Cambodia, I knew I had to visit it too! 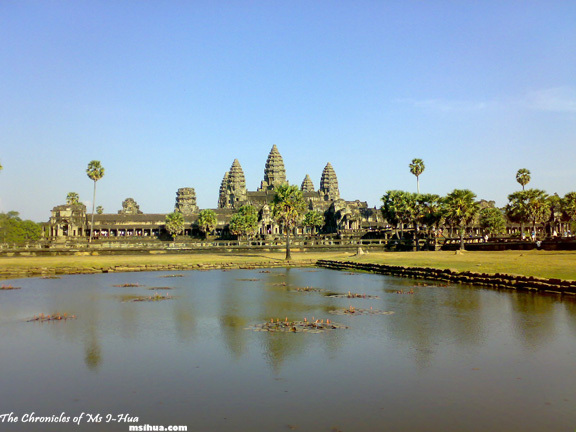 Angkor Wat (Angkor means City; Wat means Temple) lies about 5 and a half kilometres away from the modern city of Siem Reap. 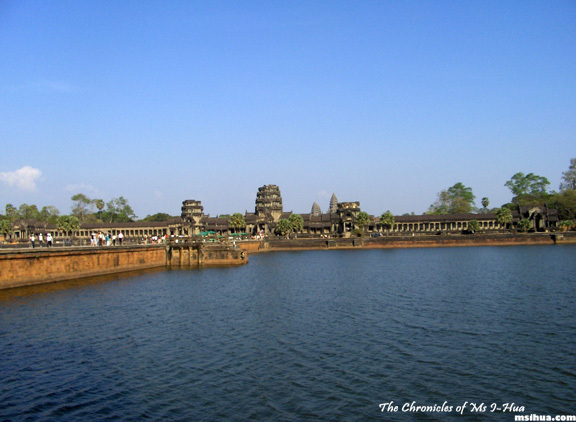 Built in the first half of the 12th century during the reign of Suryavarman II and subsequently passed from kingdom to kingdom and religion to religion. 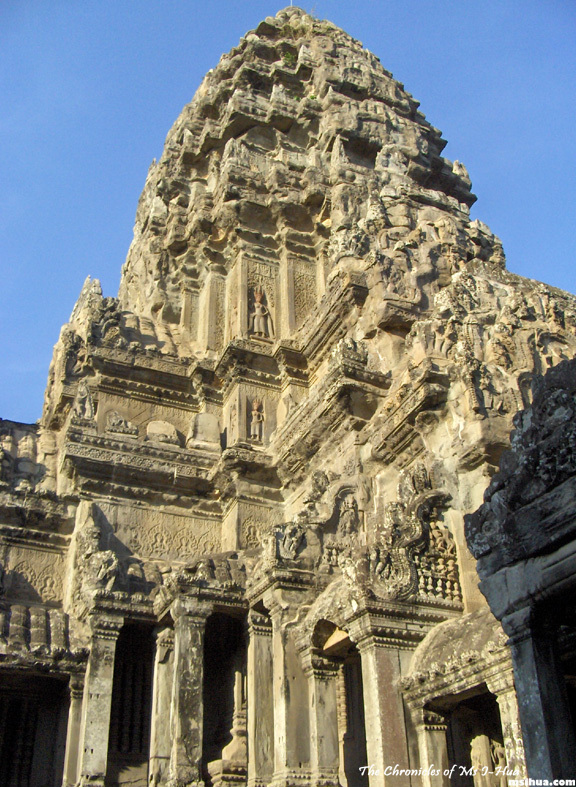 You can read more about it via Wikipedia or the Angkor Wat History page which will give you more details on the history, foundation, and architecture. I would just like to show you the beauty and splendour that was rediscovered in overgrown jungles, covered by moss, vegetation and various flora. Restoration began in 1986 and became part of the UNESCO World Heritage Site as of 1992 and is now a major tourist attraction. These steep steps (pictured above) were extremely difficult to attempt and one had to climb up on all fours (rather like rock climbing with no gear). If you do plan to climb, be very careful as a number of tourists have plunged to their deaths here attempting this on the way down. Alternatively, there is one section (there are 4 of these “stairs”) that have been cordoned off with harness and hand rails to prevent such tragedies from re-occurring. 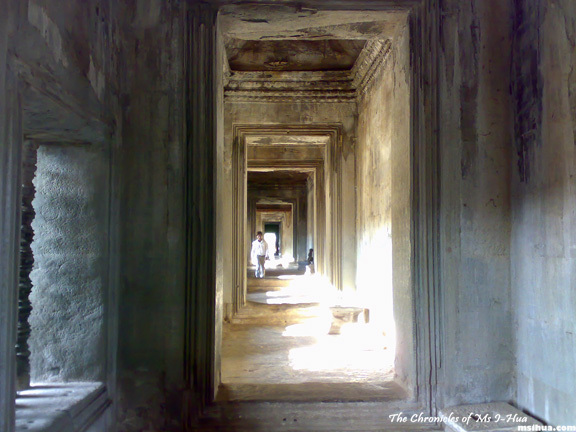 Once you manage to get to the top of the temple, the cool limestone hallways provide relief (as it does get very hot) and history lessons. 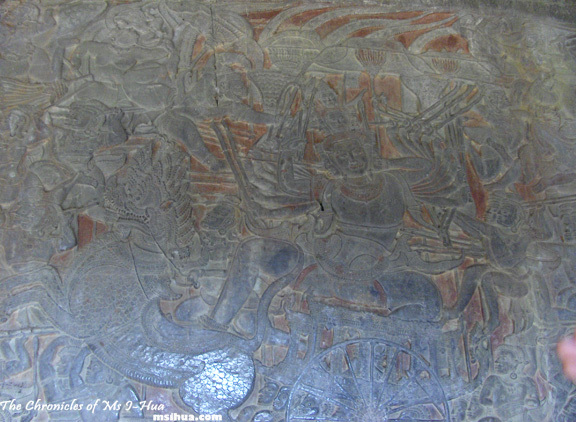 Inscribed on the walls within Angkor Wat are beautiful stories taken from the Hindu epics of Ramayana and Mahabharata. Indeed, this is a sight to behold and one could stay there for hours (which we did) just in Angkor Wat alone admiring the architecture, art and day dreaming the daily lives and rituals from long ago. Weather and clothing-wise, Cambodia lies in the tropical zone and anything lightweight (and decent) will suffice. I would suggest cotton as it is the best in these conditions. Hats, sunscreen and mosquito repellent would be your best friends as well. Best time to travel would be from November to March as they are the cooler months, from late May to early November, the rainy season transcends and you will have to be careful in visiting Angkor Wat at this time, as the limestones can get pretty slippery (and dangerous). Be wary of touts and children begging for money. If you give even one of them or smile at any, you will be swamped by a horde of children and you will find yourself between a rock and a hard place. If you do feel the need to donate money to the poor, please do so at the charity centre. 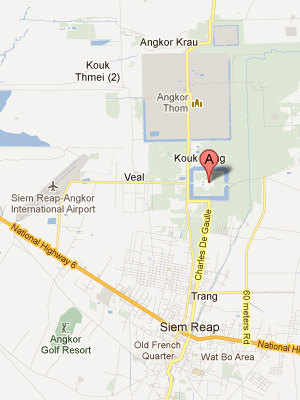 We pretty much flew in from Kuala Lumpur via Air Asia and landed at the Siem Reap airport. Prior to our flight, we had pre-arranged a ground tour guide (they are very good, and all have identity cards and uniforms to let you know they are licensed and not dodgy), to pick us up and to take us on our guided tour. The tour guides are available on the grounds as well, and can speak various languages to suit your preference (but best to check with your local tour agent). 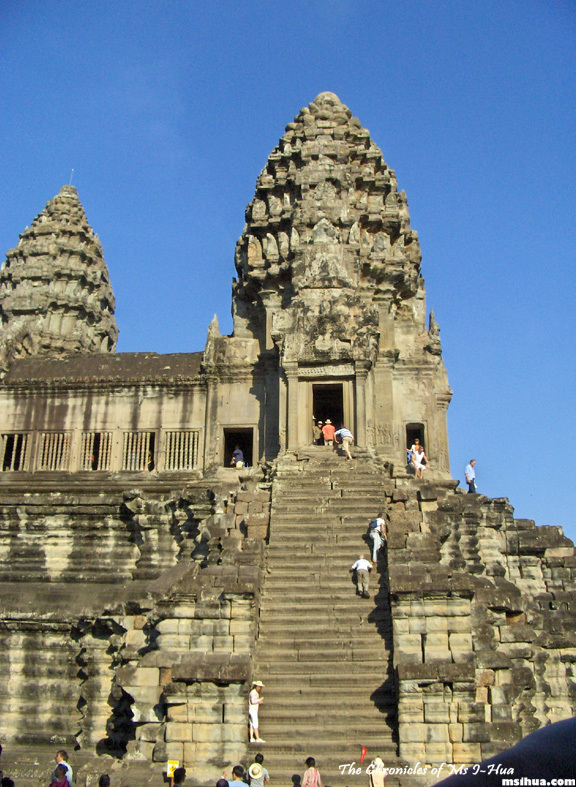 Angkor Wat is only one section of the entire ancient city discovered, and you may be interested in visiting the other ruins and sites. If you really want, you could even visit the site where the movie Tomb Raider was filmed. For more information as well as tips on travelling, you could visit the Lonely Planet page. when did you go to angkor wat? Lol… not at all! I went in 2007 🙂 But nothing changes which is the best part of it all! Cambodia is so beautiful! I’ve been wanting to go ever since I saw my friends photos. No one wants to go with me though because most people I know prefer the big cities and shopping 🙁 How long did you spend there? We only took 3 days, which was more than enough if you just wanted to cover the highlights, either that or I would have spent weeks excavating every little corner! I love history! Waaa… I don’t think I remember you blogging about travel until now! Ang Kor has a rather pretty mystique about it, and you don’t get souvenir shops lining the temples, thank goodness. I quite liked the atmosphere around Siem Reap too. *cough* slack *cough*… I haven’t done much that’s true.. but have you read my Egypt and BKK posts? Great post! My sister went here and she was fascinated by the history too! Lorraine @ Not Quite Nigella recently posted…Win 1 of 10 Dilmah Rare Uva Seasonal Flush Teas! When did you go? Only recently? Just did a month in Cambodia, Month in Vietnam and then finished with a month in Laos. Spectacular and Want to go back as I only scratched the surface. Wow! A month each?? I’m soooo jealous!!! I wish I had gone with you! We went for sunrise and my friends were all fed up by 11am so I had to leave or else be stranded walking around by myself 🙁 I know I missed loads…. One of my places to visit….one day. One day 🙂 So many places to see! Your article is very good. So it is academic. I like very much. Thank you.